American democracy is at a crossroads. More than a decade of attacks on voting rights and democratic participation—from Shelby County v. Holder to restrictive state voter ID laws—have undermined the core principles of representative democracy and have eroded the political participation of everyday people and the Rising American Electorate. Moreover, tens of millions of eligible citizens are excluded from our political process because of barriers to voter registration. Cities and counties can address this problem head-on by increasing registration in their jurisdictions through the expansion of voter registration to city and county agencies that serve the public. With this reform, designated local agencies offer eligible voters the opportunity to register to vote when applying for other services—for example, through agencies that provide human and social services, affordable housing, and health programs, among others. Local agency-based voter registration is key to increasing voter registration and decreasing registration disparities that exist for low-income communities and communities of color. 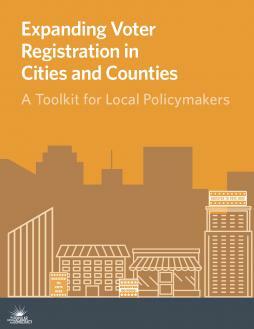 A model local agency voter registration ordinance, which provides local jurisdictions with model language and highlights the key areas for local elected officials to tailor their policy to fit within the unique context of their particular jurisdiction. Communications materials, to help local elected officials and advocates communicate effectively about the importance of agency-based voter registration.